I love the new Sneak Peek set by The Angel Company called "Treasure It". It is a 2-step stamping set and is all flowers!! I love 2-step stamping stamps. They are so fun and so easy and depending on the ink colors that you choose, you can have a different look each time! The flyer that TAC put out about this new set says that it is a set of 10 but I cut mine into 9 stamps. I want to show you how I cut my stamps and I also want to share a tip on matching up your 2-step stamps. Now, first, some of you may be wondering what a 2-step stamp is. Well, that is easy! It is an image that you make in 2 steps. First, you have the solid stamp and you stamp that image on your paper, in this case it will be a flower. Then, you find the outline stamp of the image you just stamped and you stamp that on top of the solid stamp. This produces an outline of the image. Now sometimes it can be frustrating to try and match up the outline stamp on your paper exactly to the solid stamp. I have an easy way to do this and it gets great results (almost) every time!! First of all, this is what your flowers will look like once they are cut. You will notice that I put little notches in between most of the petals instead of just cutting the flower in one big circle or square shape. I like to cut my images close & I like to place as many notches in my images as I can so that when I am stamping I can see exactly what I am stamping and where I am stamping and the notches provide me with great reference points! Once I have figured out how the images line up to match each other I take a black sharpie pen and put a large dot on the bottom of each stamp in the same position (on the cling side). Now, each time I stamp the image, I remember where I stamped the side with the dot and then line up the dot on the other stamp in the same position and stamp! By lining up the dots, I know exactly where to place my image every time! Simple! I also told you that I cut my set into 9 stamps, instead of 10 like the flyer shows. This is because when the rubber comes, the 2 leaves are already lined up with the leaves on the stem. So, by leaving them together and not cutting them into 2 pieces I can stamp both solid leaves right on top of the leaves on the stem all in one step, rather than stamping each leaf individually! This is a mini clipboard that I made with this "Treasure It" stamp set and Palette inks. These are so fun to make! The photo at the top of this post is another mini clipboard and it is made with this same set using VersaMagic Chalk inks. These make cute gifts! You can use formica chips or small plastic sheets as your base. The clip that the ribbon is tied to are just mini silver binder clips that I bought at Target and Office Max (2 different sizes). When the clipboard is finished, you can take a magnet and glue it to the back. Now you have a magnet for your fridge or file cabinet. What a fun place to clip a note to someone special or to remind yourself of something that you need to buy or do. You can also clip a mini calendar to the clip. Spring Fling Ends This Week! This is the last week to purchase your TAC Spring Fling sets! Until May 31st you can purchase each of the Spring Fling sets, at a cost priced lower than retail value, with one $30 purchase! There are four sets to choose from. This is another sample from the "Happy Bug Day" stamp set which is my favorite of the four! So, so cute!! It's hard to see from looking at this photo but the bug and the grass have shimmery chalk on top of the ink which gives the card a little sparkle. The brad that the ribbon is tied to is called a Loopy Brad. All items are available in The Angel Company catalog. Want to Save Some Money??? I love to save money! I am always looking for a bargain! If that is you too, then I have a deal for you! The Angel Company is offering all kinds of sales right now. There's something for everyone!! 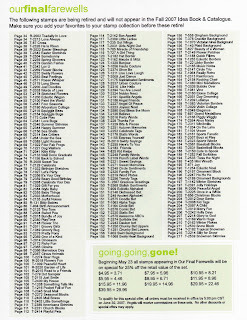 To start, the Final Farewell list is out and all stamps that are being discontinued (these are ones that will not be in the new catalog) are 25% off of the retail price! If you viewed the list already, be sure to check out the one posted here because it has been slightly revised from what was released previously. A few of the sets that were origianlly on the list have been taken off and several new ones have been added. There is a chart on the bottom of the page that shows what the cost of the sets are now. To view this in a larger format, click on the list. The Angel Company also has their Designer Paper Pads on sale for over 25% of the retail cost (these are the paper pads available on pages 30 - 31 in the TAC catalog). They are now only $5 until June 18th. Each pad is 8 x 8, has 6 different designs in 6 different colors. They are acid & lignin free and perfect for cards or scrapbook pages! The June Stamp of the Month (SOTM) is called "Monkeying Around" and can be yours during the month of June with a $30 purchase. The set has a retail value of $10.95 but can be yours for only $6.95! 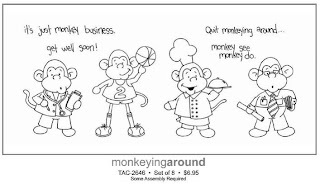 Aren't those monkeys so cute??!! These are 2-step stamping sets--my FAVORITE kind! They make coloring so easy! The way that these sets work is that you stamp the bottom image first (which is typically the solid image). With this set you would stamp one of the solid flowers first. Then, you stamp the outline of that image with a darker color. That's all there is to it! Now you have an image with 2 colors that you didn't even have to color in with crayons or pencils. Of course, you could always use these stamps alone as well. You could stamp the outline flowers and color them in with your coloring method of choice. Very versatile stamp sets! Also, don't forget that Spring Fling ends May 31st! If you want to order any of the Spring Fling sets, you have to place your order by May 31st. These stamp sets are available with a $30 purchase! Here is a project that I made a while ago that was a lot of fun! These are wood blocks that I bought from Oriental Trading Company and altered. The papers and stamps are all from The Angel Company. The "LOVE" is chipboard that is also available from TAC and I used ink to change the color and then gave it several coats of Ultra Thick Embossing Enamel to add dimension and shine. Here is a close-up photo of one of the blocks. The white swirl is from the TAC "Flourishes" set. That stamp set has so many uses, it is just awesome!! The white dots are made using the Souffle pens--another one of my loves--and the diamonds are from the "Distressed Designs" stamp set. When you turn the blocks around, they have a Christmas theme and spell "Joy". The paper on this side is from the TAC "Vintage Holiday" paper pack. It has 36 8x8 sheets for only $6.95! I love the Spring Fling set "Happy Bug Day" that is available until May 31st with a $30 order! It is so stinkin' cute!! At the last minute, I decided to enter a card (actually 2 very similar cards because I couldn't decide which one I liked better) in the monthly TAC contest--and when I say last minute, I mean that I was hoping that it would get to TAC before the deadline!! Well, the bad news is that it didn't win the contest, and that doesn't surprise me, I really didn't think that it had a chance. The good news is that it is featured on The Angel Company's website (still an honor!!) under this month's Terrific Touches! I used TAC's "Hip Hop" paper which I absolutely love! The colors are gorgeous and so bright! The bug is stamped on a chipboard piece that is part of the "Essential Elements" chipboard collection and is up on pop dots. I used several sizes of hole punches to make the holes in the strips to make it look like the bug was taking bites out of them. Both cards are very similar. The yellow one is just toned down a little so that it wasn't so bright. The yellow background paper is from the TAC "Sands of Time" paper pack. Here is a quick project that I made last week. I saw some altered clipboards at a team meeting and decided that I just needed to make one, so I did! This one was super quick and easy. It may look like I cut up all kinds of different patterned papers and glued them to the clipboard, but I didn't. This is all one piece (except for the very top where I had to piece a few together to fit around the clippy part) of cardstock from the TAC Mulberry Meadows paper pack. This is my favorite paper that TAC carries and it is exclusive to them. You can't buy this gorgeous paper anywhere else! Anyway, after I adhered the paper using Designer Dries Clear Glue (excellent glue for papercrafting), I then cut a bunch of ribbon and tied them on. The accent in the corner is just a flower (from Petal Pack which is currently not available but I hope will be in the new catalog in July) that I stamped with 2 colors of ink & punched out with a circle punch. I stamped the words "abound in goodness" from the TAC "Nurture Your Soul" word set and added stickles to the petals. That is all there was to it! Simple and fun! I have also been working on some mini-clipboards this week for an upcoming FUNshop that I'm working on! I'll upload them next week. Thanks for stopping by and visiting! I'd love to hear your comments. Do you have a question, want to see something specific on my blog, a certain technique, etc. If so, let me know by dropping me an email or by leaving a comment! Thanks!! Happy Mother's Day (a day early if you are reading this on Saturday!) to all of the Mother's out there!! I thought that I would share the Mother's Day cards that I made. These are the paper bags that I showed you earlier but instead of a graduation theme, I used a Mother's Day theme. The stamp sets are all from The Angel Company. They are: Love & Joy (flowers & sentiment inside), Trendy Greetings (Happy Mother's Day sentiment), Soft Spoken (mom) Deco Designs (birds), Swirly Gigs (flourishes) & the Spring Fling set Punctuation (parenthesis & journal lines). The Love & Joy flowers on the front are embossed in white and I mixed purple glitter in with them--made it nice & sparkly (which you can't see in the photo). The patterned papers that I used are Mulberry Meadow & Genevieve, also by TAC. This time I wrapped a ribbon all the way around the bag so that I could tie a bow on the side. It looks very pretty and I hope that my mom will love it!! By the way, I have the greatest mom and I love her so much! I am so lucky to have her in my life! I love you mom!! I have finally found a more user-friendly way to share my TAC samples with you! On the left-hand column you will see a category called "Visit My TAC Gallery!". That hasn't changed. What has changed is that now all of the stamp sets that I currently have uploaded samples for are listed. If you click on the stamp set, it will take you to my gallery that has samples for that particular stamp set, all arranged and viewable together. If you want to view my entire gallery, also arranged by stamp set, you can click on the link (within that category) that says "All TAC Samples". This should be be much easier than clicking on each individual sample! Another great thing about this new gallery is that you can subscribe to its feed. Basically that means that each time I add samples to the gallery it will notify you and show you where those samples (or folders) have been added. How cool is that?? If you aren't sure what I mean by "Feeds" and all of that, I have explained this in more detail below. I hope that all of this makes sense! If you have questions or would like to see a sample of a particular stamp set, please let me know! If I don't have the stamp set, I will find someone who does and get samples to you! I hope that you enjoy this new gallery! I love it!! Here's another quick card using the TAC Spring Fling "Happy Bug Day" stamp set. The paper is from the Catelynne collection (again!!). The snail is stamped using the Rock & Roll technique (gives you 2 different colors of ink on one image) and then I filled in a little more color with the tip of my ink pad. The green paper corner was made by cutting a square diagonally--very simple! The grass is actually the "legs" of the bugs but it makes really nice grass too!! I used a black Micron pen to make the eyes of the snail black. Don't forget! Spring Fling ends May 31st!! How Much Difference Does Ink Color Choice Make? Have you ever had an idea in your head and when you put it to paper it came out totally different than you had intended? Sometimes you like it and sometimes you hate it, right? Or, how about the times that you've seen samples made using a certain set but when you get and use it you just don't like the results? Been there, done that!! Sometimes the difference comes from the colors that we choose to use--either ink colors or paper colors. Those choices really can make or break a card sometimes. Or, on the flip side, do you really like a card that you've made but you want to change it up a little? Try changing the colors! I decided that I wanted to try a little "test". Last week, I made two cards that are almost exactly the same but they use totally different ink and paper colors. I used the stamp set "Blossom Builders" from The Angel Company (TAC) and the words came from the stamp set "Sail Away". Each card is built the same. I tried to stamp the flowers and shapes in the same position. They are each stamped on white cardstock and adhered to a solid cardstock as the base of the card. Each card also has twill wrapped around each section and has 3 flower centers that were cut out with the coluzzle and then adhered with pop dots. The centers of those flowers have stickles on them. Look at how totally different these two cards turned out even though they are made almost exactly the same way! That will give you an idea of how you can change a card just by using different colors of inks or papers. And, as a side note, changing the embellishments that you use on a card can also greatly change the way a card looks as well. Try using different ribbons or brads or other accessories. You might just surprise yourself with how it turns out! I also took a photo of the "Bright" blossoms card from the side so that you could see the dimension that the pop dots add to the cards. A quick note about twill. Did you know you can stamp on twill or ribbon to customize it? I found that twill was one of the easiest ribbons to stamp on and that the VersaMagic Chalk inks worked the best. The Palette inks (on the twill) bled just a little but the chalk ink went on nice & smooth and left a nice, crisp image. So, if you want ribbon with flowers but can't find what you're looking for, make your own! Want to add a sentiment to a busy card (like the ones here) but can't find a good place to put it, stamp it on your ribbon! Would you like to make a card that doesn't look like a standard card yet will still fit in a regular sized envelope? I have a few ideas for you! If you would like to see a close-up of any of these cards, just click on the picture. This first card is called a "Joy Fold" card. I'm not sure where that name came from, but it is a fun card to make with a unique look! Basically you have a panel that opens to reveal the message inside. Very cute! You can see from the second picture how it opens to reveal the inside message. The card part opens and so does the panel. I used the The Angel Company's "Love & Joy" stamp set for the flowers on the flap and on the inside of the card. The "plant smiles" sentiment is from the TAC "Nurture Your Soul" word set and the large "Laugh" stamp is from a set called "Fun Time". All inks used are Pallette inks (the best!!). The patterned paper is from the TAC "Catelynne" collection. The second fun card is a tentfold card that has become quite popular recently. Basically, it is a smaller card with the top image piece attached so that it sticks out above where you fold the card. Believe it or not, this still fits in a stardard size (A2) envelope! This stamp set is a fun one called "Retail Therapy" and it is colored with watercolor crayons and a dove blender. There are stickles on her dress and on the presents. The paper and tag are from the TAC "Catelynne" paper collection. Graduation will be upon us very, very soon. Have you thought about buying all of those graduation cards? It can get a little pricey! Why not make your own? Here is a card that I made this week, intended for graduation. It is made out of a paper lunch sack that has been folded in half! How fun is that?! This bag is white, but you could also use a regular kraft colored bag. Or, if you want lots of color, you can also get colored bags. The design on this card was inspired by one that I saw while at an Team meeting this past weekend. I do not know who made that card but she had used a gel pack over the boat to look like water. I didn't want to go through all of the trouble to do that, but I did want to mimic that look. After I colored my image (from the TAC set "Pull Up Anchor") and cut it out using the oval Coluzzle template I covered it with VersaMark ink. Then, I took Ultra Thick Embossing Enamel (UTEE) and sprinkled it on top to cover the image entirely and heated it with my heat gun. Because UTEE is so thick, it will not cover the entire image in one shot and instead it makes a water drop effect. You can see this in a little more detail by clicking on the image and viewing it up close. I used shimmer chalk that TAC carries (GREAT product) to add a light splash of color to the white background, enhancing the "water drops". There is also a pull out tag that goes inside the opening of the bag. The stamps that I used on that page are from the "Punctuation" set that is available during Spring Fling with a $30 purchase through May 31st. On this tag I can write a memory or sentiment or scripture verse to the graduate and it is also a great place to include a monetary gift. The "pull" on the tag is made by punching out two 2" circles, gluing them together and then attaching them to the back of the tag. Pretty simple. You could use this "bag" card for so many other occassions as well. It would be great for anytime you are giving a gift card or monetary gift. It is also a lot of fun and sure to impress the recipient!! I am so excited to share with you that I won another TAC contest! This was a Terrific Trio contest where you submit 3 cards made with no more than two TAC stamp sets. My entries are below. If you would like to view them on The Angel Company website, click here for the link.